I mentioned once before that we altogether stopped buying table salt a while ago. And, when you cut out all processed foods (on a Paleo/real foods diet), you tend to dramatically lower your overall sodium consumption. But, neither of these means pure, natural salt is unhealthy at all! The original "Paleo Diet" by Loren Cordain was low-salt, but since then the Paleo community has evaluated more research about salt and sodium, and nowadays, most Paleo bloggers/authors/doctors/community leaders are pro-sea salt. Nice summary of some real food perspectives on salt here. I, too, used to assume that salt was unhealthy in large quantities, and could cause heart disease or high blood pressure or other conditions. But when I learned about Dave Asprey's Bulletproof Diet and "biohacking" through diet, sleep, and stress reduction, I heard his recommendation to take a teaspoon or two of ancient sea salt every morning to kick start your adrenal glands, in addition to him talking about the general benefits of sea salt. He even had an extreme guy on this podcast who ate TONS of natural salt for an experiment and did not experience any of the health dangers we're warned about. Not that any of us need to try it at home. Table salt is manufactured, not found in nature, and contains toxic hard mineral anti-caking agents (great piece on what all's in table salt here). I do not eat table salt (ever, if I can help it), but I eat real, naturally harvested sea salt (my favorite is pink Himalayan sea salt!). 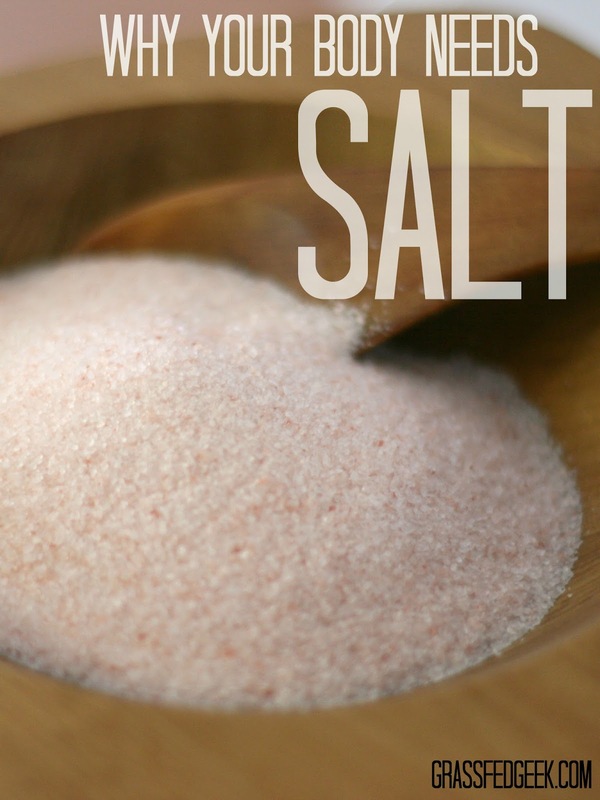 Sea salt contains essential trace minerals and electrolytes (the pink color actually indicates the trace minerals), and Himalayan salt is about 250 million years old, so it was deposited long before the Earth became polluted with heavy metals and pesticides. For many years of history, salt was a precious commodity--"Worth your salt," as they say (in fact, the Roman word for "soldier" translates to "one who is paid in salt"). I've found that when I try the "dose" of sea salt (with water!) in the mornings, it fits in well as part of my stabilizing, energizing morning routine, perfect for starting out with a nice walk or meditation at the beginning of the day. When we're stressed, our adrenal glands are overworked, and we can support them with real salt function (here's a post about healing the adrenals with salt). Adrenal fatigue is commonly talked about these days, and stress reduction is so important--through mental and diet techniques. You may not be up for eating spoonfuls of salt plain, but don't be afraid to add a little extra natural sea salt to your food!